Versico is one of the largest manufacturers of EPDM single-ply roofing systems. EPDM has been in use in the USA since the 1960's and is one of the most common types of flat and low-slope roofing materials. EPDM membrane thickness ranges from thirty mils (0.030") to one-hundred mils (0.100") with the most common thicknesses being forty-five mils (0.045") and sixty mils (0.060"). There are three standard application procedures: (1) fully-adhered; (2) mechanically-fastened; (3) loose-laid. Fully-adhered EPDM uses water or solvent-based adhesives to adhere the rubber to the substrate. Mechanically-fastened EPDM is attached by manufacturer-approved mechanical means to the substrate, and loose-laid membranes are secured only at the perimeters and any penetrations. A ballast of round river rock or concrete pavers is used to hold the materials in place. River rock is usually installed at a rate of 1000 - 1200 pounds per roof square (100 square feet) and the pavers generally weigh approximately 20 pounds per square foot. 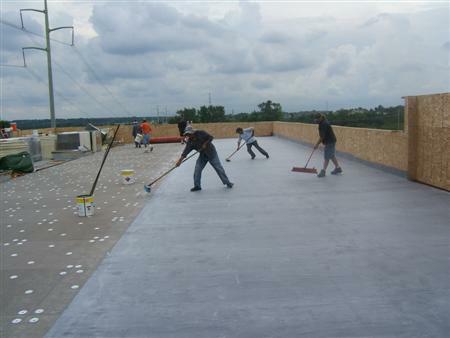 EPDM roofing membrane is installed over a new metal deck and rigid Poly-Iso insulation. Versico, Inc. is one of the largest manufacturers of EPDM roofing material in the United States. 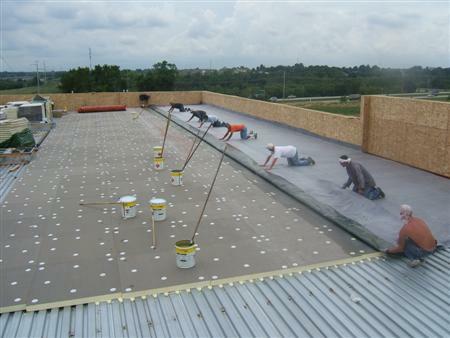 Commercial Roofing technicians install a fully-adhered EPDM system. 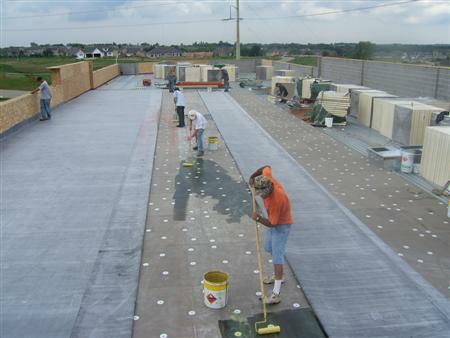 EPDM can be mechanically attached, or, fully adhered to the roof deck with bonding adhesive. The roof is swept smooth to relieve the membrane of bubbles and wrinkles. Attention to detail helps insure the successful outcome of this roofing project.